Home » Health » What Is Dwarfism? Dwarfism is a disorder that causes the height of the sufferer to be below the average. 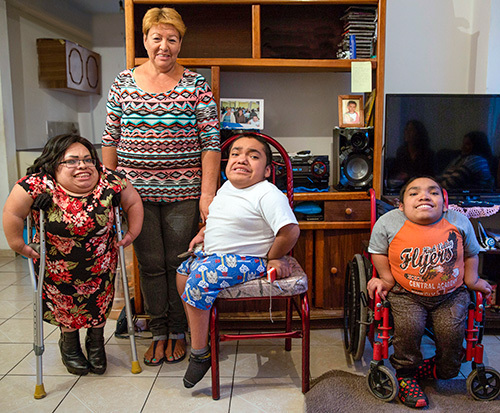 Experts define dwarfism as height in adults not more than 147 cm. But generally, people with dwarfism only have 120 cm tall. Dwarfists have a disproportionate body size, where their body size is normal, but their legs are very short. In addition, the size of the patient's head also looks bigger. In more rare cases, people with dwarfism can also have short body and leg sizes, so that they look proportionate, including the size of the head. Height in patients who are adults between 90-120 cm. Growth rates in childhood are slower, with height about one third below the standard. The size of the head that looks large and disproportionate, with a prominent forehead and a flat top of the nose. Fluid accumulation in the brain (hydrocephalus). Spinal deformities, such as oblique or hunchback, which can cause nerve complaints, such as numbness . Wide and round chest shape. The upper arm and leg size are shorter than the bottom. Limited movement in the elbow area. Short fingers and toes, with a wide distance between the middle finger and ring finger. O-shaped limbs, which cause pain in the knee and ankle. Genital organs that do not develop in adolescence. Turner syndrome , which is a gene disorder in women that can inhibit growth. Diseases that affect the lungs, heart, or kidneys. Treatment of arthritis, which can inhibit growth hormone. As the name implies, disproportionate dwarfism is characterized by the size of a limb that is not proportional to one another. This condition is most often caused by achondroplasia , a genetic disease characterized by short arms and legs, but the size of the head remains normal. In a number of cases, doctors can expect a baby in the womb to experience dwarfism, through an ultrasound examination of pregnancy . Whereas in newborns and during development, doctors can recognize dwarfism through routine examinations. In the examination, the pediatrician will measure the height and weight, and the child's head circumference. The measurement results for each inspection will be recorded and compared with normal growth standards. Through examination, the doctor can find out if the baby is experiencing growth barriers, or has a disproportionate head size. Doctors can examine X-rays to get a clear picture of the child's skull and bones. Then, to find out if there are abnormalities in the growth hormone producing glands, the doctor will carry out brain MRI. Hormone testing is done to measure the levels of growth hormones and other hormones that play an important role in the child's growth process. Genetic tests are conducted to determine whether dwarfism in patients is caused by genetic disorders, such as Turner syndrome. Synthetic hormone injections are given daily to children who lack growth hormone. Injections can be given until the age of 20 years, to achieve maximum height. In patients with dwarfism with Turner syndrome, injections of estrogen are given to stimulate puberty and the growth of sexual organs. This estrogen injection will be given until the patient reaches the age of menopause. In patients with disproportionate dwarfism, surgery is performed to improve the direction of bone growth and shape of the spine, reduce pressure in the spinal cord, and remove excess fluid in the brain if the patient also has hydrocephalus. Leg lengthening surgery in people with dwarfism is still controversial, because the risk of causing fractures and infection complications. Therefore, first discuss with the doctor about the benefits and risks of this action. Give support to the head, neck and upper back, when the child is sitting. Use a child-only chair when in the car, to support the neck and back properly. Avoid carrying a child with a sling that does not support the neck and makes the back curved like the letter "C". Teach and familiarize children to eat foods with balanced nutrition from an early age, in order to prevent excessive weight problems. Note if signs of complications arise in children, such as sleep apnea and ear infections. Invite children to ride or swim, but avoid risky sports, such as soccer or gymnastics. Have frequent ear infections and are at risk of hearing loss. Excess body weight, which increases interference with joints and bones. Pregnant women with dwarfism will be advised to undergo a caesarean section during childbirth, because the size of their pelvis does not allow for normal delivery. 0 Response to "What Is Dwarfism?"